Once again taking the lead on National Classic Movie Day, the Classic Film and TV Cafe hosts the FIVE STARS BLOGATHON where fans share their five favourite classic film stars and the reasons they are revered. Click HERE to join the party. The ability of a star or leading player to capture our imaginations and to fully deliver the writer and director's vision of a film through talent and charisma is enviable and admirable. The stars of classic Hollywood instilled affection in fans during their lifetime that lives on with succeeding generations. "And Starring MISS BARBARA STANWYCK as Victoria Barkley"
I was 10 years old and the TV western The Big Valley was in its second season. I already thought the character of Victoria Barkley, widowed ranch owner, was pretty special with her independence and confidence, but the above opening credit let me know in no uncertain terms that the lady playing that role was something extra special as well. 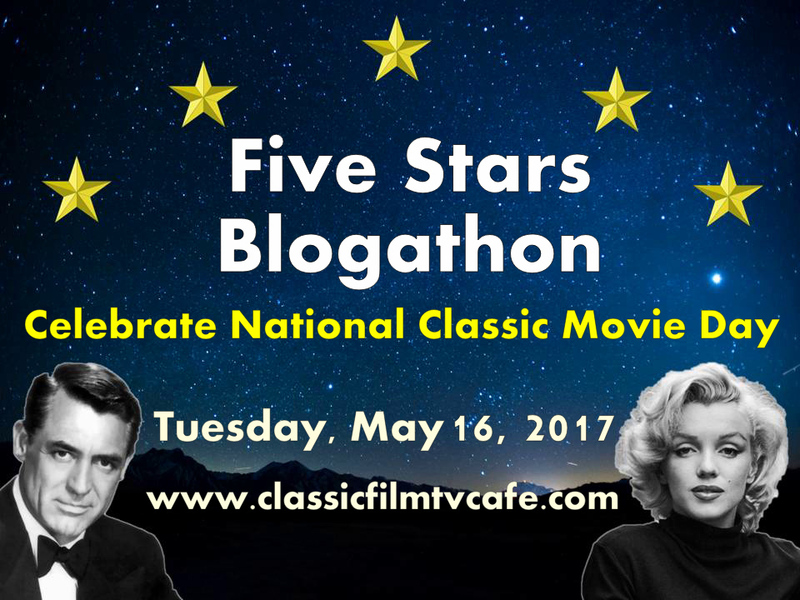 As my exposure to and interest in classic movies grew I discovered just how special. Meet John Doe, Remember the Night, Ball of Fire and The Strange Love of Martha Ivers burn in my memory. This lady was strong. She was touching. She was sarcastic and sweet. She was dangerous. 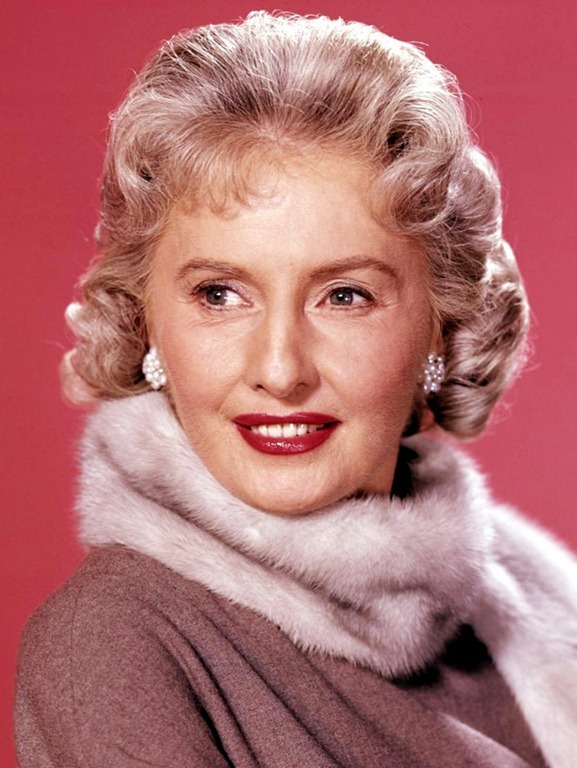 Barbara Stanwyck wasn't even trying, but she took a foothold in my heart as my favourite actress. "Missy" Stanwyck's reputation as an actress who took her work, but not herself seriously, and who treated all members of a crew, onscreen and off, with respect and kindness has cemented her as my favourite movie star. "Egotism - usually just a case of mistaken nonentity." 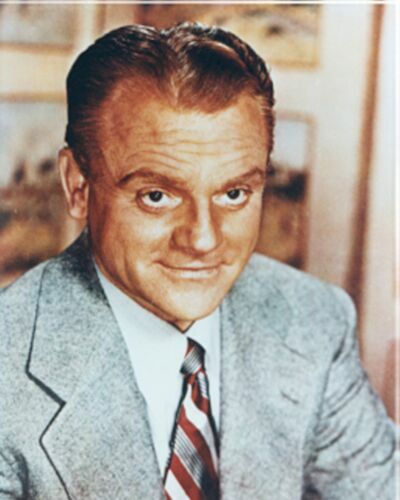 Growing up and watching old movies on television, James Cagney epitomized the golden era for me. I couldn't tell you the first movie I saw him in, but these favourites jumble together in my mind creating the mythic Cagney. There was Angels With Dirty Faces and Yankee Doodle Dandy and The Strawberry Blonde and The Roaring Twenties, all of them watched over and over and over again. If those performances aren't enough to inspire lifelong awe, then I'd be hard pressed to come up with what would do it. Cagney's electric energy and that contemplative nature that led his friend Pat O'Brien to refer to him as "the faraway fella" combined to create something more than an actor or a movie star. I believe Cagney has become to his many fans something of a friend - someone we would want to know. "All I try to do is to realize the man I am playing fully, then put as much into my acting as I know how. To do it, I draw upon all that I've ever known, heard, seen or remember." One of these without the other would not be a movie star. Oliver might have had a marvelous career, perhaps even an Oscar, as a character actor. Stan may have gone on to write and direct outstanding comedies for other actors. Together Laurel and Hardy became screen immortals. Oliver Hardy from Georgia moved into pictures in its infancy in Florida and became a valuable character player adept at "heavies" and comic foils. 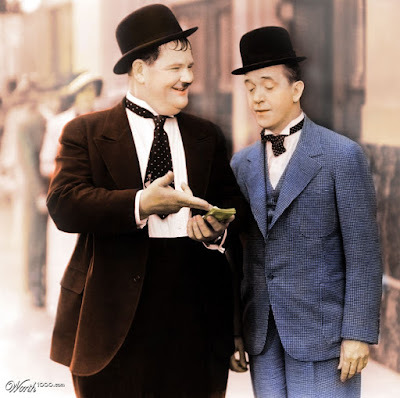 Stan Laurel from England took the Music Hall and Vaudeville route to movies and was at the Hal Roach Studios working as a gag man and seriously considering giving up performing. Fate had them cast together and the fertile comedy minds at work at the Lot of Fun saw too many possibilities with this teaming to let them get away. Two careers were inextricably combined and the world is a better place for the laughter they continue to bring us today. Like many, my introduction to Laurel and Hardy was annual television showings of Babes in Toyland. In my teen years CBC television showed their silent shorts. Laurel and Hardy have been with me in times of joy and times of trouble. Both times have been made better by their presence. "People have always loved our pictures. I guess that's because they saw how much love we put into them." 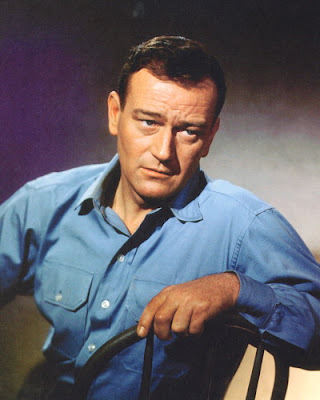 Unlike my other favourite classic movie stars, John Wayne was a star I grew up watching on the big screen in the 1960s. I believe the first movie I saw him in was Donovan's Reef. Such fun! Then there was McLintock! and the mudslide. The Sons of Katie Elder was epic. The night I saw True Grit for the first time is unforgettable. Someone should have warned me about seeing The Shootist at a theatre. I'm not keen on crying in public. At the same time as those movie outings I was seeing John Wayne's older films on television, often with my dad and my sisters. I was mesmerized by his classics with John Ford and delighted by his early Three Mesquiteers series. John Wayne's magnetic presence and his acting skill, which I come to appreciate more and more, make him a truly great movie star and a lifetime favourite. I am always happy when watching "Duke". "John Wayne is underrated. He's an awfully good actor. He holds a thing together; he gives it a solidity and honesty, and he can make a lot of things believable." I love your list! But I especially grinned when I read Laurel and Hardy. Yes! I'm glad their inclusion made you grin. I bet that would make them happy. CW, I certainly can't argue with any of your choices! I've always liked John Wayne, but have come to respect his performances more as I grow older. I thought L&H might be on your list! Thanks so much for #NationalClassicMovieDay. And thanks so much for this intriguing and fascinating exercise. Am I getting too predictable, or do we just know each other too well? I loved seeing Barbara Stanwyck top your list! She captivated me as well in "Meet John Doe" but I adored her work in "Christmas in Connecticut" and look forward to seeing it each year. I don't think many people think of Missy as a Christmas gal, but with Christmas in Connecticut, Meet John Doe, Remember the Night and My Reputation - she is the lady to watch in December. Great list. "Starring Miss Barbara Stanwyck..." indeed! We sat up straighter on the couch when that came on the screen. I love that you put Laurel and Hardy together, and how neat to point out alternate careers they might have had, had they not become a team. Barbara Stanwyck demanded our respect, and our best posture! Nice list. I, too, adore the inclusion of Laurel & Hardy (of course). You surprise me (hee-hee). The are shimmering stars in the cinema firmament. From one Cagney fan to another--great list! I like Barbara Stanwyck, too. It was great that she allowed her career to change with her as she aged vs. trying to stay young and desirable like some others did. She was certainly sensible as well as talented. Great list! Barbara Stanwyck just missed out on my top five, but she has always been a favorite. And I am adore the silent comedy shorts of Laurel and Hardy. Although westerns are not my favorite McClintock has long been a favorite film of mine and makes me laugh every time I watch it. Yes, indeed McLintock! is a lot of fun. I feel about it the same today as I did when I was a kid. One gal's actor is another gal's movie star. This was quite an exercise for fans like us. Once I came up with my first, I left it alone. No matter the other personalities that knocked at my door, I held fast. Great picks CaftanWoman. I almost picked Barbara Stanwyck and Jimmy Cagney myself, and Laurel & Hardy have been favorites since childhood. Great film selections too. Thanks for sharing your faves. Thanks. It was a pleasure. Hmmm, I read your post early this morning and thought I posted a comment. Guest not. Anyway, we are in a definite agreement on Ms.Stanwyck as she made my list too. I also, like others, loved your pick of Mr. Laurel and Mr. Hardy. Always at their best in their shorts. Think I am going to have to watch a couple soon.This making me get the urge. Every once in a while my daughter will suggest we order a pizza and watch Stan and Ollie. Just something to keep in mind when you're watching the boys. Pizza, Stan & Ollie! Perfect! A solid list. Like the use of quotes from each star. Thanks! Never would have thought of the Laurel and Hardy pairing, but how right you are! And I love how with your reasoning and these great quotes you made this listing of faves a standout. I appreciate the compliment. Thanks so much. It broke my heart to leave Barbara Stanwyck off my list, but it looks like she's been getting lots of love from others today so hopefully that balances it out. Great list! I need to see more John Wayne films, but I completely agree with Howard Hawks's quote. Indeed. Hawks knew a thing or two about movies and, obviously about John Wayne. Happy National Classic Movie Day! I adore Barbara Stanwyck and was and still am a huge fan of The Big Valley, the theme music is such a perfect fit it really sets the pace of the show, and Stanwyck, despite often wearing period inappropriate outfits-where the hell did she find a leather slack suit in 1868 Stockton, CA? !, is ideal in the lead. I’ve managed through the years to see all her films. From the sublime-Christmas in Connecticut, The Mad Miss Manton, and My Reputation etc.-to the atrocious-Escape to Burma, Mexicali Rose, To Please a Lady-she never gave less than her all. Maybe not at quite the same level but I am a big Cagney fan as well. He could be tough or tender but his hugely energetic dynamic personality always pulled your eye right to him. I can’t say the Duke was always as memorably impressive acting wise as those two but his impact was enormous and when he was on his mettle-The Searchers, Fort Apache, The Man Who Shot Liberty Valance-he could be deeply affecting. I can’t say I’ve ever been able to crack the allure of Laurel & Hardy but I respect their mastery of their craft. Just five is SO tough! I’d have a hard time limiting myself to a favorite 50! But I’m going to try for the five. My first three I fell for as a kid and they’ve stayed at the top ever since but the last two are battling it out for their slots with dozens of others who its killing me to leave out. First and foremost is Linda Darnell. I fell for her hard as a kid in Blackbeard, the Pirate though looking back on it now it’s hardly her best but derring-do and a lady in distress are what a young boy looks for in a film. Best films: A Letter to Three Wives, Summer Storm, No Way Out, This is My Love, Fallen Angel, Hangover Square, The Lady Pays Off and Everybody Does It. Next would be Susan Hayward. Again as a youngster there was a series called The Movie of the Week that played the same film three times a day for a week. I happened upon The President’s Lady where she and Charlton Heston played Andrew and Rachel Jackson, I was fascinated by her mixture of toughness and vulnerability and watched the film as many times as I could. By happenstance the next week’s film was With a Song in My Heart where she played Jane Froman and I was hooked for life. Best films beside those two: They Won’t Believe Me, Deadline at Dawn, The Lusty Men, I’d Climb the Highest Mountain and I’ll Cry Tomorrow. John Garfield-First saw him in the allegorical Between Two Worlds and while the rest of the cast was excellent he fairly burst off the screen with his dynamic personality. Though the years I’ve managed to see all his films and he remains my favorite actor. Best films: The Breaking Point, Under My Skin, Dust Be My Destiny, Body & Soul, The Postman Always Rings Twice and Humoresque. The hauntingly unique Margaret Sullavan is someone who I regret isn’t better known. Her smoky croak of a voice that can convey reams of unspoken meaning, her large darting eyes and simplicity of expression make her standout from her contemporaries. She more or less hated making films and Hollywood and only made a small number of movies so I can’t say the fault is entirely the studios. But when she did work it was something special. Best films: The Shop Around the Corner, Cry Havoc, Back Street and The Shopworn Angel. Lastly I’d have to say Thelma Ritter. She’s kind of a two-fer with Susan Hayward. Her no-nonsense astringent fortitude as the nurse Clancy in With a Song in My Heart captivated me and I’ve been a devoted fan ever since. I’ll see anything she’s in and she’s never disappointed. Best films: Rear Window, The Mating Season, Pickup on South Street, Titanic, Pillow Talk, How the West Was Won….I’d say All About Eve but while she’s terrific her role is so small. My husband would agree totally with you on Linda Darnell. My favourites with Linda are A Letter to Three Wives and Unfaithfully Yours. In a cast of comedy greats she really held her own. My late dad was a big fan of Hayward's. He called her "Susie baby". I still have the soundtrack album to With a Song in My Heart. Froman is singing, but Susan is on the cover. John Garfield is eternally the troubled rebel. Of all those great movies you listed, The Breaking Point is my favourite. Today just happens to be Margaret Sullavan's birthdate. I really like all the movies you listed and would add The Mortal Storm. I imagine many script writers cheered when they learned Thelma Ritter would be reading their words. Nobody else like her. You are such an honorable person, CW. See, I would have used Stan & Ollie as 1 choice and weaseled another in there. I will try to be more like you in the future. I love your choices, of course, and they are just so "you" (which is a great thing). Full disclosure: I was not above considering Messrs. Laurel and Hard as one choice, but then I thought people might think I don't know how to count! Fabulous choices! I approve of every selection, especially Laurel and Hardy. I love that you included their quotes, too. It looks like Barbara Stanwyck is getting a lot of votes in the blogathon, no? And for good reason! Thanks. For all the thinking this blogathon made my poor head do, it was a lot of fun. Part of the fun is seeing how pops up on the most posts. Part of the fun is slapping your head and saying "d'oh!" Great choices... especially Laurel and Hardy! I must confess I never miss a John Wayne film on TV (I'll watch one tonight!). You're welcome, and thank you. Oh, that sounds like they had a lot of fun. I imagine for the actors it was a cold, messy and long day (or maybe even two) of shooting, but it's a hoot in the movie. I was unexpectedly offline this week, else I would've chimed in much sooner. Just wanted to say good job. One of your better posts. Oh, thank you very much. I'll walk a little taller today with that compliment. I hope it was for a pleasant reason that you were offline. Sometimes I feel better for just pressing "shut down". Oh, you know how to pick 'em! Very nice list you have. Although she wasn't on my list, Stanwyck is right up there for me! Thanks for a fun read! Five is a difficult number for this exercise, but if we didn't have a limit, we'd go on and on about our favourites. I have no doubt you are a Stanwyck fan. Ah Miss Stanwyck- I admit while she's not my favorite- I do like a lot of her movies! Its so peculiar- like I wouldn't want to read a biography of her- But I would watch a movie with her because she's talented. I love Ball of Fire! Since you like a lot of Missy's movies, perhaps one day she'll crack a spot among your favourites. If not, that won't stop you from finding more movies to enjoy.